If you would have parked @ 1/4 of a mile from that gate is a cement bridge with a small parking lot. You would have seen a trail on the north side of the road beyond the fence there. It is 2.7 miles to the springs from there. The Family canyon is where Charles Manson and his Family camped while in the area. Thus the name. It is on the right hand side of where the trail splits at the fence just before the Bradford ridge. The Bradford ridge can be seen from the hot springs it is a 600 foot climb from the Pacific Crest Trail to it's peak. 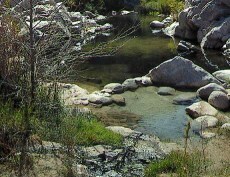 The P.C.Trail follows Deep Creek in the hot springs area. I believe the springs elevation is 3385 feet. Good luck, REMEMBER to carry out your trash !